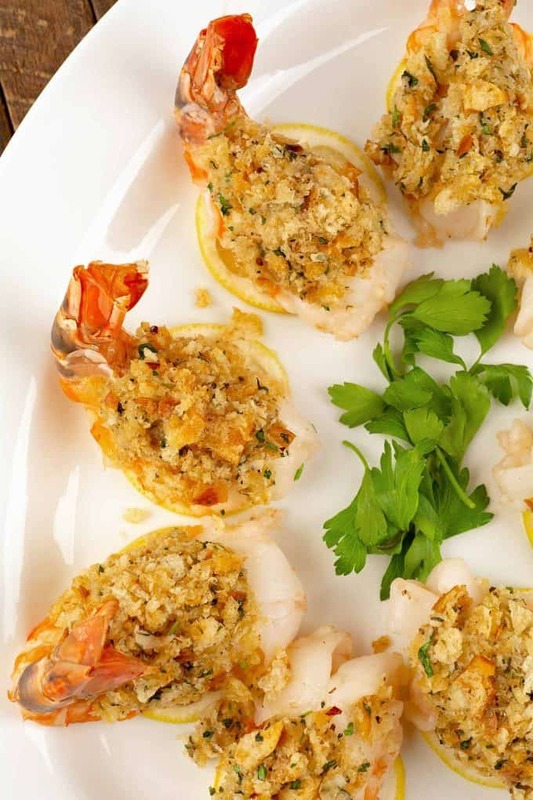 Baked stuffed shrimp is a time-tested New England restaurant dish that’s easy to make at home. 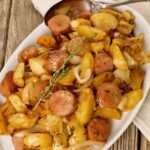 It’s a great choice for a special occasion, easy to prepare, and once the stuffing is made, only takes about 15 minutes to cook. 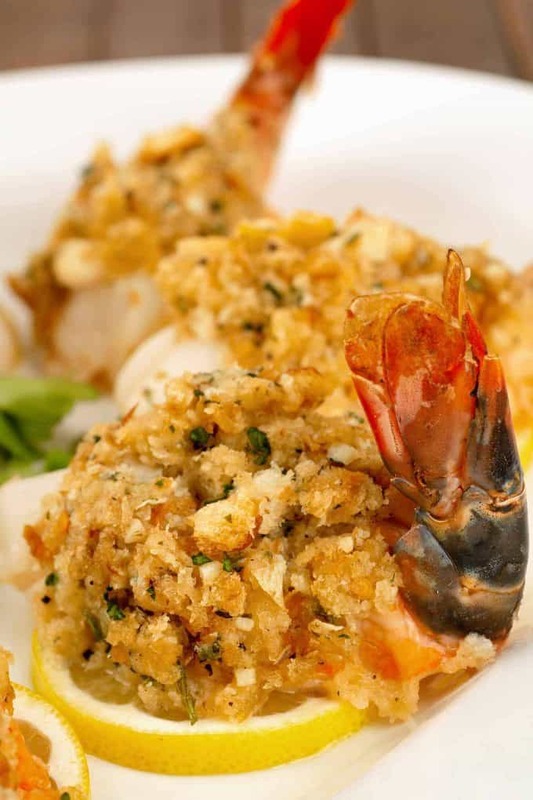 Our baked stuffed shrimp stuffing is a simple combination of fresh breadcrumbs, butter, minced garlic, white wine, parsley, parmesan cheese and a pinch of crushed red pepper. 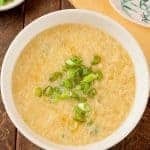 To make it we sauté the garlic lightly in butter, then simmer it for a minute or two in white wine before adding in the fresh breadcrumbs and remaining seasonings. 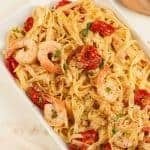 That little bit of wine makes the breadcrumb mixture moist enough to be easily formed on top of the butterflied shrimp before baking. 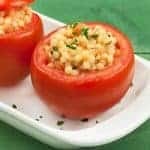 The great thing about this dish is that it can be made ahead to this point and refrigerated. 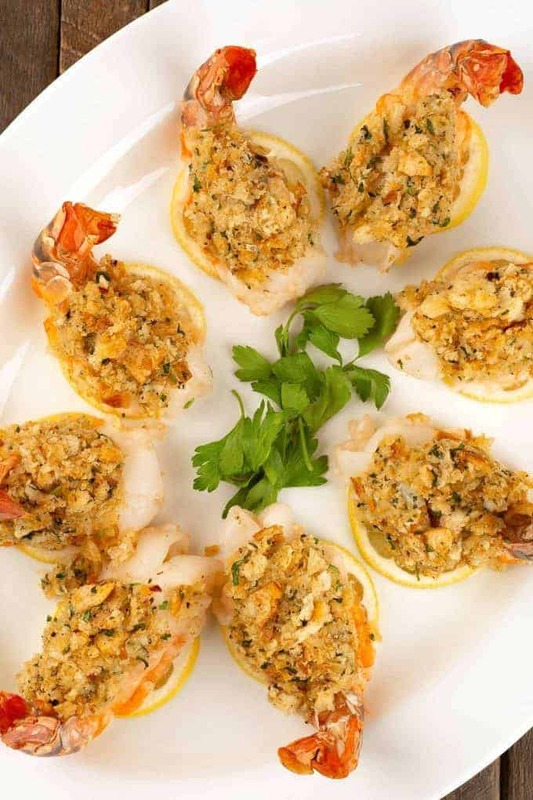 That makes baked stuffed shrimp a favorite for a company dinner because you can get all that preparation out of the way long before your guests arrive, and just pop the shrimp in to bake a few minutes before serving. 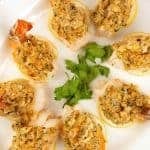 Baked stuffed shrimp is also the perfect substitute for lobster tails in a classic Surf and Turf dinner, and the make-ahead option leaves you free to concentrate on cooking your filet mignon to absolute perfection. This recipe is part of our Italian Christmas Eve menu. You’ll want to buy the biggest shrimp you can find for this dish. We used “extra colossal” or U/10 shrimp, a sizing term that refers to shrimp that come 10 or fewer to the pound. Peel and devein the shrimp, leaving the tail intact. To butterfly them, make a slit along the back side, taking care not to slice all the way through the body. Line a baking pan with aluminum foil, spray with nonstick spray and arrange the shrimp in a single layer. Melt the butter over medium heat and add the olive oil. 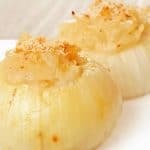 Add the garlic and sauté until fragrant, soft and just beginning to turn golden – do not brown. Stir in the wine and cook for 2 minutes. Remove from the heat, and allow to cool for 5 minutes. 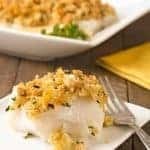 Add the breadcrumbs, parmesan cheese, parsley, oregano, crushed red pepper, salt and black pepper to the garlic and butter mixture and combine thoroughly. Spoon even portions of the breadcrumb mixture over each of the butterflied shrimp. Using your fingers, gently mold each portion of stuffing around the shrimp. Note: This recipe can be made ahead to this point and refrigerated until ready to bake. Bake the shrimp for 12 to 15 minutes, or until they turn pink and opaque. Remove from the oven, sprinkle with lemon juice and serve immediately. Even though I’m normally not a huge fan of shrimp, these are amazing. 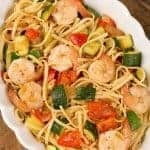 The shrimp turns out really moist and delicious, and the flavors are simple but absolutely perfect when you’re craving seafood. Glad you gave our recipe a try even though shrimp aren’t your favorite variety of seafood. And thanks for letting us know you liked them!